There are many choices of compression pedals on the market today – options including Red, Blue, Orange, Over-easy, curvaceous, warm, and hard, to name a few. Those of you that have explored different compression options know the importance of really digging into a piece of gear to properly identify if the unit will meet your expectations and suit your needs and applications. Depending on the guitar you play, the ED-1 is a very good sounding compressor. We first tested the pedal using a Strat with single coil, low-output pickups. The ED-1 worked beautifully, giving us a very smooth and warm sustain when placed in series with an overdrive pedal. More importantly, using the pedal by itself provided a very clean, compressed sound excellent for individual note riffs and soft/hard comping techniques alike. Depending on the adjustment of the Emphasis and Attack control features, the ED-1 responded with a desired tone and effect comparable to other units of similar value. However, when the ED-1 was tested using a Les Paul with stock high-output humbucker pickups, the pedal took on an unwanted, and unusable, characteristic in the clean setting: the pedal input was overdriven by the guitar, causing the signal to break up, particularly noticeable when using a hard comping/picking technique. Of course, it stands to reason that even a high-output single-coil (or stacked single coil) pickup may also overdrive the ED-1, so if you plan on using multiple guitars with different pickup configurations, definitely test this pedal out with the guitars in question first. Hopefully, Marshall will correct this obvious flaw in subsequent revisions of this otherwise-excellent pedal. 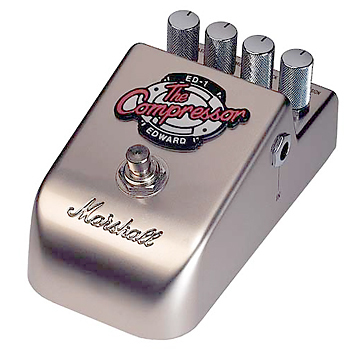 The Marshall ED-1 Compressor pedal is retro in design, and is comprised of four adjustment knobs that control Emphasis, Volume, Attack and Compression settings. The Emphasis function (Hi/Lo adjustment and everything in-between) allows the user to select which end of the tonal spectrum you wish to emphasize. For example, turning the Emphasis knob to Hi will allow the high end on your guitar to ring freely while the low end will be compressed and vise versa for the Lo setting. Setting the Emphasis knob to center will allow even compression across the entire tonal spectrum. 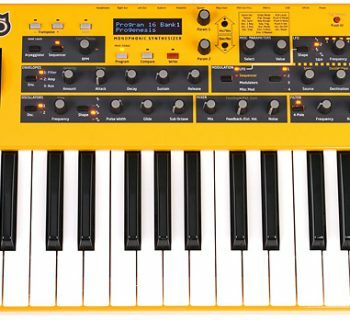 As for the remaining three functions: Volume controls the level of sound, Attack controls the level of the initial strike of the note/string, and Compression adjusts the amount of compression desired. 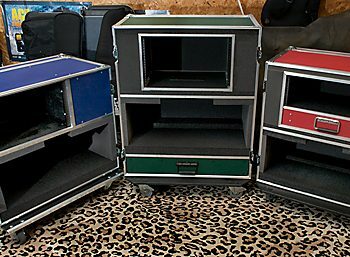 The ED-1 is housed in a heavy-duty metal chassis with chrome metal knobs, a metal button-style foot switch, an LED to display On/Off status, and standard nine volt battery compartment (and a jack for an optional AC adapter). This pedal was extremely easy to use, but Marshall provided some sample settings to get us started easily. Using the sample settings as a starting point allowed us to make some minor adjustments to achieve our desired sound. The extra-tall control knobs, though tightly spaced across the unit, provided ample amount of grasping surface to make adjustments. The depth of the recess for the knobs allowed plenty of room for access with our fingers and also provided protection against accidental level changes from our foot. One design flaw we noticed with the control knobs was that the highly polished, chrome, dome top on the knob reflected light no matter which angle it was set at, making it very difficult to see the black line indicator for level settings. In addition, we found that the black markings began to wear off from the moment we first used the pedal. From a power standpoint, the ED-1’s battery compartment is found on the bottom of the unit and requires a coin or screwdriver for opening. We tested the ED-1 using both battery and a Voodoo Lab Pedal Power 2 Plus. Both applications performed consistently and did not pose any issues. We tested the Marshall ED-1 Compressor using a Fender Eric Johnson model Stratocaster and a ’59 reissue Gibson Les Paul running through a late ‘70s Marshall Super Lead 100 head (contain your jealousy) and 4x12 cabinet. The results between the single coil pickups and humbuckers made a huge difference in the performance of the ED-1. Good news first – we found the performance of the ED-1 to be very pristine and clean sounding using the Stratocaster. We were able to use all parameters and combinations of each control to achieve a desirable compressed sound. The compression level provided a very subtle compression in the 8:00 position while providing a very hard compression in the 4:00 position. In adjusting the Emphasis control, we detected a slight change in tonal character of the initial guitar sound depending on the position of the effect. We could definitely hear the difference made by the Emphasis control setting between Hi or Lo and its effect on the tonal spectrum. If you plan on using a guitar with hot humbuckers, though, this pedal won’t be a good choice. In our test using the Les Paul, the pedal was actually overdriven by the guitar and produced noticable dirt in the initial attack. This was particularly apparent during hard chord comping. We were able to adjust the volume pot on the guitar down to correct the issue, but of course you alter the tonal characteristic and volume by doing so. Perhaps beneficial to this pedal would be the addition of a simple pad switch for input level adjustment to suit a wide range of guitar pickup configurations. Using the Marshall ED-1 in an effect chain provided a desired sound when using overdrive or distortion. The pedal leveled out the overdrive to a smooth, sustaining wave and also added some presence to the attack during our flurrying leads. 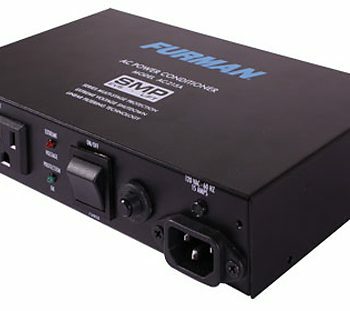 Marshall provided good documentation regarding connections and sample settings to get the user acquainted with the unit. This pedal is simple in function and does not require much instruction for functional use and effect creation. The Marshall ED-1 Compressor ($119.99 MSRP) sells for approximately $70, which falls squarely within the middle range of compressor pedals.